Virginia Railroads And Railfanning In "The Old Dominion State"
Virginia railroads feature typical Appalachian operations; plenty of coal moving from tipple to tidewater with stiff grades that must be conquered to complete the journey. However, the Commonwealth also includes operations not often found in Appalachian states (partly because it lies along the Atlantic Coast), a large port that provides important container traffic and north-south main lines, connecting the Northeast with the Southeast. The Old Dominion State may no longer be home to names like the Norfolk & Western Railway or the Richmond, Fredericksburg & Potomac Railroad but today successors CSX Transportation and Norfolk Southern Railway carry on operating many of their, and other fallen flags’ lines in the state. Additionally, Virginia is served by a handful of shortlines, most of which are located in the eastern regions of the state (or directly along the coast). Virginia railroads date back to 1830 when the Petersburg Railroad was chartered to connect Petersburg, Virginia with Garysburg, North Carolina. A distance of about 62 miles the railroad opened its main line in 1833 and after operating for 65 years, it was merged into the Richmond & Petersburg Railroad in March of 1898 eventually becoming part of the Atlantic Coast Line system. The original Petersburg Railroad route became the Atlantic Coast Line's primary main line to Richmond and today it remains an important artery in successor CSX Transportation's system, more than 170 years since the route was constructed. In the succeeding years following the opening of the Petersburg, Virginia would come to know many of the South’s most celebrated railroads. Many of these railroads played a vital role in both developing Virginia and seeing it prosper, such as serving the Port of Norfolk/Newport News in the southeast and tapping the state’s rich coal reserves to the west. 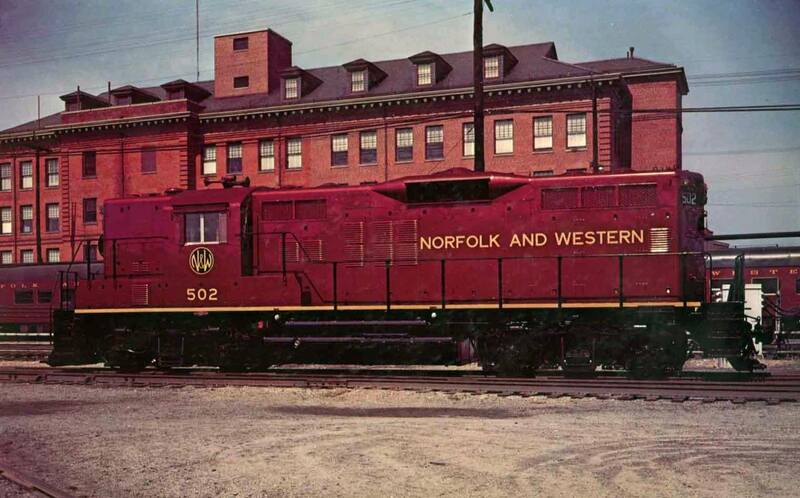 While railroads like the C&O, Virginian and RF&P have particularly left their mark on the state, perhaps no other railroad is more synonymous with Virginia than the Norfolk & Western. 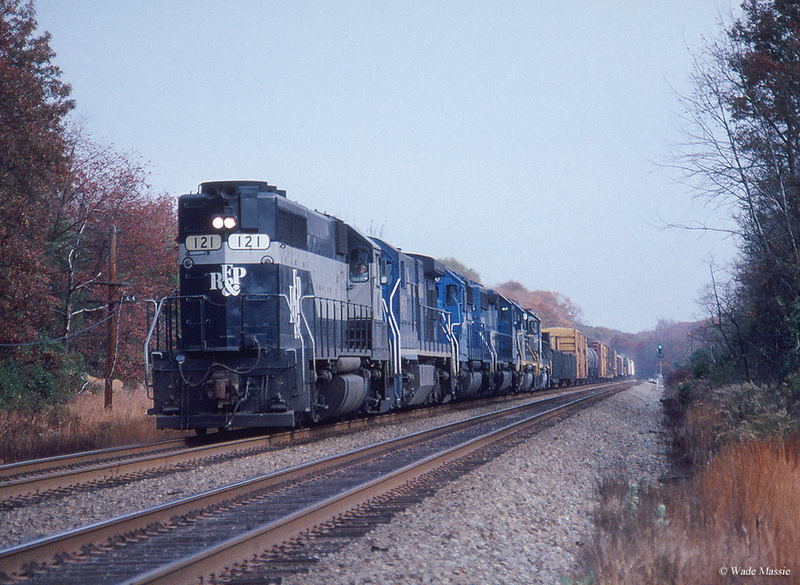 Today, with the Southern’s main north-south line that terminates in Washington, D.C. and the N&W’s east-west route that connects Norfolk/Newport News with most of the large markets in the Midwest (including Chicago) successor Norfolk Southern operates most of the strategic routes in Virginia (not to mention the Virginian's main line that follows much the same route as the N&W along with all of the coal mines the NS still serves in western Virginia and southern West Virginia). While CSX operates the former C&O, SAL, ACL, RF&P and Clinchfield lines in the Old Dominion State none offer quite the strategic advantage afforded by the N&W, Virginian and Southern lines. 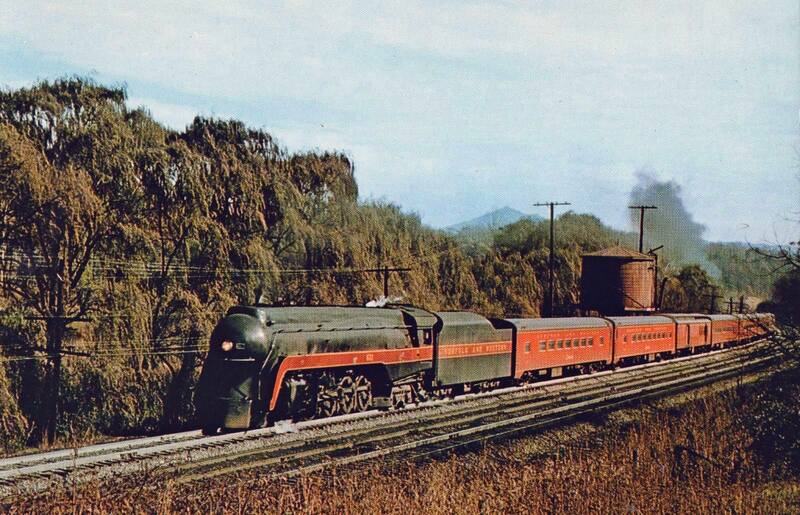 Aside from the Class Is, Virginia railroads also feature a handful of shortlines which include the Bay Coast Railroad, Buckingham Branch Railroad, Commonwealth Railway, Norfolk & Portsmouth Belt Line Railroad, Chesapeake & Albemarle Railroad, Shenandoah Valley Railroad, North Carolina & Virginia Railroad, Virginia Southern Railroad and the Winchester & Western Railroad. In total, Virgina's railroad network today consists of about 3,200 miles, which is about 68% of its one-time high of 4,703 miles that occurred during the 1920s (the "Golden Age", as it's also known). Much of the state's loss of trackage was through coal branches, secondary lines, and smaller railroads that were abandoned before the 1980s. 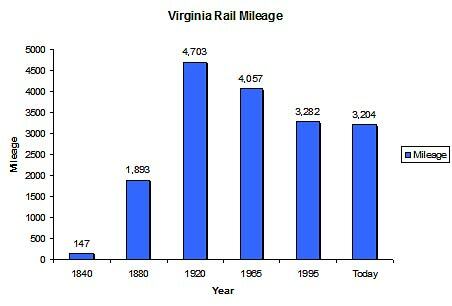 For more information on Virginia railroads, in terms of route mileage over the years please take a look at the chart below. 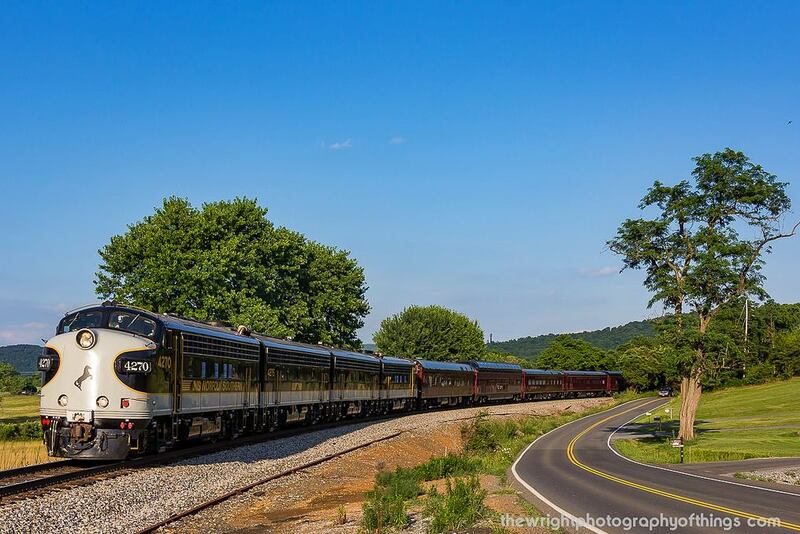 Passenger trains are still alive and well in Virginia with Amtrak operating the tri-weekly Cardinal along with the Crescent and Silver Service operations. The Commonwealth also operates commuter services with the Virginia Railway Express (VRE) which has a line connecting Manassas with D.C. and another connecting Fredericksburg with D.C. Future commuter operations include The Tide, a light rail initiative to serve Norfolk and Virginia Beach as well as the Columbia Pike Streetcar project which will link Pentagon City with Skyline, Virginia. If you are interested in museums, Virginia is home to several although aside from the O. Winston Link collection perhaps none is more recognized or popular than the Virginia Museum of Transportation which houses the former N&W J-class 4-8-4 #611 and A-class 4-8-8-4 #1218 (which were part of Norfolk Southern’s popular steam program prior to its ending in 1994). In all, Virginia railroads offer everything from rugged mountain railroading to intermodal and commuter rail. Depending on what kind of railroading you’re interested in, you are sure to find it in the Old Dominion State!